The 2nd Annual Ride For Ronnie Motorcycle Ride and Concert, benefiting the Ronnie James Dio Stand Up And Shout Cancer Fund, will take place on Sunday, May 22nd. 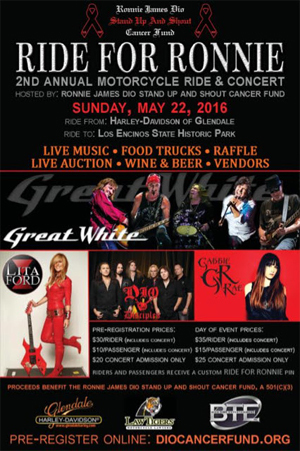 Riders will assemble for a continental breakfast at Harley-Davidson of Glendale with kickstands up at 11 AM. The Ride will take them through the streets of Los Angeles County to Los Encinos Park in Encino, where they will be treated to an afternoon of live music, raffle and live auction, food trucks and more. The Inaugural Ride, held in May 2015 as part of a weekend of events commemorating the 5th anniversary of the passing of Ronnie James Dio, contributed to raising $155,000 for the cancer charity from that weekend's events. Live entertainment in the park will be provided by rockers GREAT WHITE, LITA FORD, DIO DISCIPLES, GABBIE RAE, BUDDERSIDE, SONIA HARLEY, and DOCTORS OF THE EARTH. A live auction will be held during the concert that will include a stage-played guitar donated by Chris Broderick of MEGADETH with autographed photos of Chris playing the guitar and a B.C. Rich guitar signed by Ronnie James Dio, Rob Halford (JUDAS PRIEST), Bruce Dickinson (IRON MAIDEN), King Diamond and Geoff Tate. The Dio Cancer Fund hosted a free street party on March 5th at Harley-Davidson of Glendale to pre-register riders for the 2016 Ride For Ronnie event and to draw the winning ticket for a one-of-a-kind "Holy Diver" motorcycle with 100% of the net proceeds going to the Dio Cancer Fund. "Boston" Tom Foresteire of Northridge held the winning ticket and will lead this year's Ride on the 2015 FXDB "Street Bob" model Harley-Davidson that was custom-painted with the illustration from the cover of Ronnie James Dio's iconic Holy Diver album. Both riders and concert-goers can purchase their tickets by going HERE. The Ronnie James Dio Stand Up And Shout Cancer Fund (diocancerfund.org) was formed in memory of the legendary rock singer Ronnie James Dio, who lost his life to gastric cancer in 2010. A privately funded 501(c)(3) charity organization dedicated to cancer prevention, research and education, the Ronnie James Dio Stand Up And Shout Cancer Fund has already raised over $1 million. Monies raised have been committed to the cancer research work of the T. J. Martell Foundation for Cancer, AIDS and Leukemia Research, the gastric cancer research unit of the M.D. Anderson Cancer Center in Houston, where Ronnie was treated for gastric cancer during the last six months of his life, and other cancer research projects. The recent passing of several high profile musicians to cancer has served to reinforce the commitment of the Dio Cancer Fund to support research and education that furthers early detection, prevention and treatment of prostate, colon and gastric cancers. The Dio Cancer Fund also participated in the Inaugural Axes And Anchors cruise to the Caribbean in February. Members of the Fund's board hosted two live auctions where a variety of rock memorabilia was auctioned off to raise funds.